Are you ready for the celebration? We sure are & we have tips to share as well. Here are the top 5 Green Tips for celebrating a more sustainable Easter Holiday this year. 1- Buy farm raised eggs – If you are buying eggs, look for farm raised eggs. This means that the chickens were not living in crammed boxes or crates. 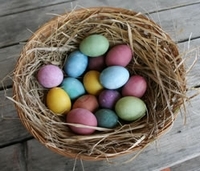 2- Make your own Easter egg dye – If you choose to dye eggs this Easter, consider making your own. Here are some examples of ingredients: Beets & Cranberries for Pink, Red Cabbage or Blueberries for Blue, Red Onion Skins for Red, Yellow Onion Skins for Orange, Grape Juice for Lavender, Orange or Lemon Peels for Yellow, Spinach for Green, and Coffee for Brown. Boil the eggs and any of the mentioned ingredients for color with a teaspoon of vinegar for 15 minutes…and presto you have beautifully dyed Easter eggs! 3- Don’t buy cheap plastic Easter baskets – If you don’t already have Easter baskets, consider buying a nice well made basket from wood or other sustainable materials that can be used year after year. 4- Use real grass clippings or recycled paper in baskets – If you are making Easter baskets this year, don’t buy the wasteful plastic grass, consider using real grass or find some old magazines & cut up the pages to be used as a colorful filling. 5- Buy fair trade and organic candy – To fill those Easter baskets, choose fair trade and/or organic candy! That way you are supporting fair working conditions and keeping toxic pesticides away from your loved ones. Have an eco-frindly happy Easter! Green is a beautiful color. It stands for spring and for life, and for Easter. Beautiful post! It reinforces the Easter message. Nature is God’s gift to us. One way of loving Him is to preserve Planet Earth by planting trees this coming Easter.